As promised in the blog post earlier tonight announcing the first Alfred v2 beta, here are a few workflows Mega Supporters can import to get started. Search Google with a keyword or a hotkey, and launch in various browsers. This is a great starting point for creating your own alternative searches. Use the “folders” keyword to perform a filtered search on folders only, then open then automatically with TextMate. Change what file types you search or choose a different “open with” application for a really useful quick filter to your files. Use a hotkey to paste the current contents of your clipboard as plain text. Type “movie” and the name of the movie you want to watch to search for trailers on YouTube (using Chrome – handy if you don’t otherwise have Flash installed on your Mac), open IMDB for more details and open Rotten Tomatoes to find out how bad that movie really is. If you still want more, check out David’s Tumblr for a few more useful workflows. He has created a Chrome Bookmarks search which presents results in Alfred, a Google Auto-complete workflow, a fantastic-looking Rdio search and a Mail.app search. He’s been working hard! After many months of hard work, we can finally share the first Alfred v2 beta. As you’ve seen from the recent sneak peeks, there are huge improvements and some great new features, like workflows, that will make Alfred more powerful than ever before. This is a beta release: While it has been tested and Andrew & I have been using it as our day-to-day Alfred version, you may still encounter unexpected behaviour or bugs. Some features may also change between now and the final release, so be flexible, especially when it comes to workflows. To help us keep track of bug reports, please email us or join our forum, rather than tweeting us. Beta is limited to Mega Supporters: To help us limit the volume of feedback for the beta, only Mega Supporters can take part at this time. If you have a single user license from v1, you can choose to upgrade to Mega Supporter to join the beta. If you prefer to wait until it’s fully tested, hold off until v2 goes to general release to upgrade to a v2 single user license. Questions about licensing? Have a look at the FAQ. Keep version 1 handy: Some features are not yet complete in this beta; for example, there is no iTunes Mini Player yet. You can keep versions 1 & 2 running concurrently by choosing different hotkeys, and we don’t recommend deleting v1 just yet. Over the coming weeks, we’ll be releasing new builds when they’re ready, will publishing documentation and help pages, and prepare for the general release. Without further ado, Mega Supporters can download the beta here to get started. Once you’re up and running, come back and we’ll post some workflows you can import today! One of the joys of writing a new version from scratch is the ability to improve and re-think many of the small imperfections from the previous version. You’ll find that v2 is full of clever little touches that will make your experience more pleasant. Andrew took great pleasure in improving this particular aspect of the user experience; Users with external screens would occasionally find that Alfred was confused about where to appear on screen after disconnecting from the second screen. 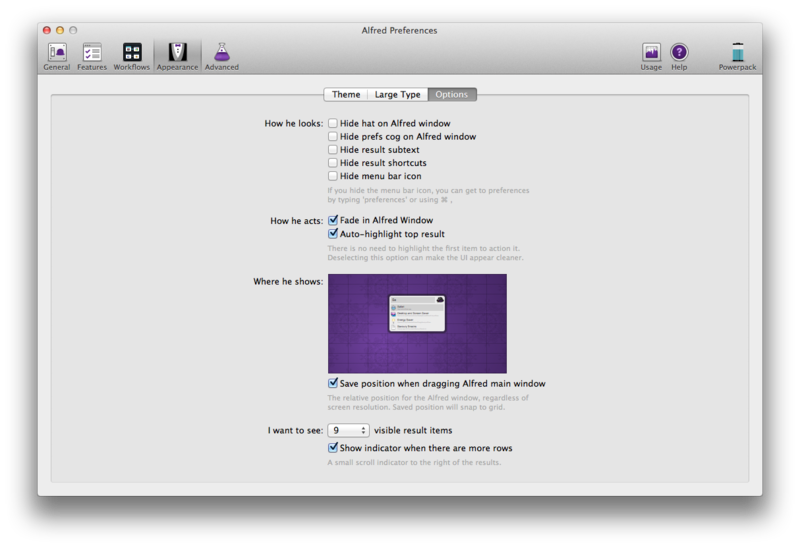 The preferences for v2 resolve that, as you can position Alfred’s window on your screen and, regardless of your resolution, he’ll remember it next time. This is one of the many areas that have received attention and polish to make using Alfred as pleasant and easy as possible. You can look forward to discovering the rest for yourself during the beta!